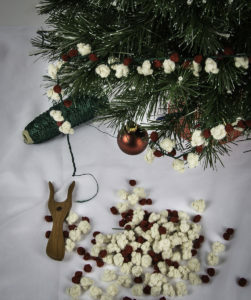 Several years ago I knit a pile of cranberries and popcorn, and strung them on black thread for our Christmas tree. They have become a favorite decoration, and I noticed this year that they were looking a little wan and ragged. This year, after taking down the tree, I unstrung them and gave the cranberries and popcorn a bath, which rejuvenated them wonderfully. Instead of re-stringing them, I decided to attach them to Lucet cord as if they were beads. I ordered rayon for the cord, and it is working out really well. 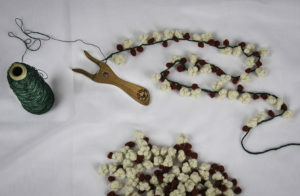 The decorations are more stable, and the cords will be much easier to place on the tree, and to store between seasons. Plus, when they get dirty again, I can wash and dry the entire “beaded” cord very easily. I am so pleased with how it is turning out. Now, I need to finish this cord and make more cranberries and popcorn! I think I may be making these, on and off, for the rest of my life…..